A hard-hitting combo of egg, a beef sausage patty and melting slice of cheese on a classic English muffin. Served warm and tasty. Available until 10:30am at participating restaurants unless part of All Day Breakfast Menu. 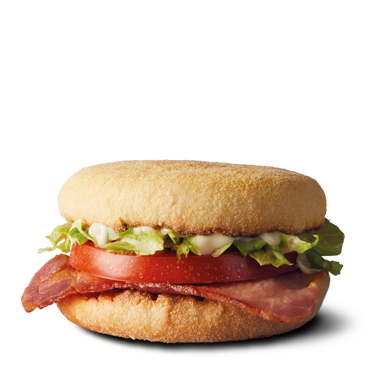 ENGLISH MUFFIN: Wheat Flour (Contains Vitamins (Thiamin, Folic Acid)), Water, Maize Polenta, Maize Flour, Wheat Gluten, Yeast, Sugar, Iodised Salt, Canola Oil, Preservative (282, 200), Acidity Regulator (297, 262), Improver (Soy Flour, Emulsifier (481), Mineral Salt (170), Antioxidant (300), Acidity Regulator (516), Wheat Malt Flour, Enzymes (1100 - Contains Wheat), Emulsifier (471), Antioxidants (307, 304, 330), Raising Agent (341), Emulsifier (472e). SAUSAGE PATTY: Beef, Seasoning [Salt, Dried Glucose Syrup, Sucrose, Spices, Vegetable Powders (Garlic, Onion), Mineral Salt (341), Hydrolysed Vegetable Protein (from soy), Spice Extract, Canola Oil]. CHEESE: Cheese (Milk, Salt, Culture, Enzymes (Rennet, Lipase)), Water, Milk Solids, Butter, Emulsifiers (340, 452, 331), Salt, Acidity Regulators (260, 330, 339), Colours (160b, 160c), Preservative (200), Soy Lecithin. OIL: Canola Oil, Emulsifiers (Soy Lecithin), Natural Flavour, Natural Colour (160a), Acidity Regulator (330). ENGLISH MUFFINS are produced on equipment that also produces products containing sesame seeds.